Bees have amazing cognitive capabilities. The scouts explore and learn the terrain and build up a highly detailed neuronal representation of the surrounding environment. Once back in the hive, locations are communicated to others by translating location information into body movements; a behavior known as waggle dance. In our experiments with a honeybee robot we noticed that some foragers seem to prefer certain nestmates in the process of decoding the dance. 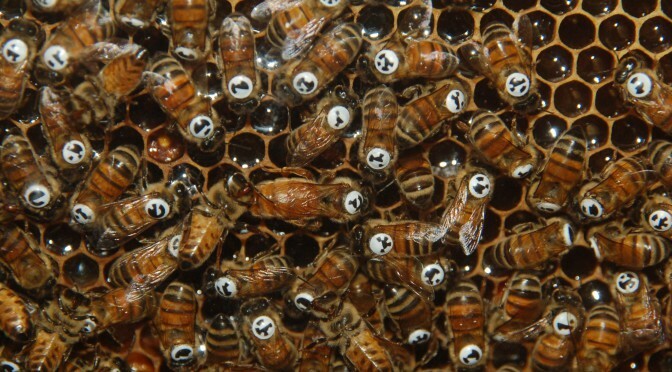 Do bees form stable “peer groups” throughout their lives? What determines that one bee becomes a “friend”? In the past, answering those questions was very laborious. Biologists would sit in front of an observation hive, keeping track of single marked bees and take note with whom they dance. We are taking this analysis to the next level. We develop a system which allows tracking every single individual inside the hive. We use unique tags to mark each bee and develop a machine vision system to find every bee in the hive. We can then tell which bees are communicating one with whom and where and how long and so on. The analysis of the complete social network has never been done previously. We are happy to work with our partner Zuse Institut Berlin where all our data (~190 Terabyte) is stored and analyzed on supercomputers. associated to: Workgroup "Intelligent Systems and Robotics"